Recent statistics show that depression and suicide are at record levels in every age group, race and gender. Within the pages of "Don't Jump! 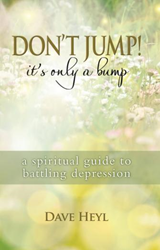 It's Only a Bump" ($14.95, paperback, 9781634138086; $4.99, e-book, 9781634138109), Dave Heyl offers readers a spiritual guide to battling depression. The book offers a solution to men and women who suffer from depression and thoughts of suicide. Dave Heyl holds a business degree from the University of Central Missouri, which led him to a career in banking and as chief financial officer of a family-owned shipyard. A devout Christian, Heyl has volunteered as a youth minister, teacher and preacher for the past 30 years and has served on numerous church and nonprofit boards. He lives outside St. Louis, Missouri with his wife of more than 30 years. They have two grown children. Xulon Press, a division of Salem Media Group, is the world’s largest Christian self-publisher, with more than 12,000 titles published to date. Retailers may order Don't Jump! It's Only a Bump through Ingram Book Company and/or Spring Arbor Book Distributors. The book is available online through xulonpress.com/bookstore, amazon.com, and barnesandnoble.com.